Disappointingly simple, even for a Laurel & Hardy short. This was a rather disappointing silent comedy short from Laurel & Hardy. It by no means is a horrible or bad movie but the movie is too simple constructed and lacks some true creativity or humor to consider this an above average Laurel & Hardy short. The movie starts of really slow and only really begins to take pace from the moment the boys enter the golf course. However also in that part of the movie it keeps lacking in some true creativity or remarkable comedy moments. The movie doesn't have any real laughs in it, although it's still perfectly fun to watch all of course. Laurel's & Hardy's antics never get boring to watch. The only thing that makes this movie stand it is the end sequence which basically consists out of one big mud fight, involving the boys, their lady friends, their rival and a whole bunch of innocent bystanders. It's always fun to see a good old fashioned mud fight. It's simple, it's corny but it just never gets tiresome or unfunny to watch. It's interesting to see Laurel & Hardy in one of the early teaming-ups and how the characters developed throughout the years. There also are a bunch of other regular Laurel & Hardy actors present in this movie such as; Dorothy Coburn, Jack Hill and Edgar Kennedy, who normally mainly plays cop roles. 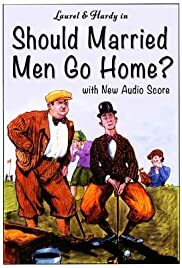 This movie as a whole doesn't stand out as the best, most original or enjoyable Laurel & Hardy silent comedy shorts, although it still is a certainly watchable one.